Jonathan meets Sara whilst Christmas shopping in Bloomingdales. Despite both of them being in relationships, they have an instant connection, go to a cafe and skating in Central Park. But then they let fate decide what to do next. And fate doesn’t bring them together again until Jonathan is about to marry Natalie and Sara is to marry Lars. They chase each other all over New York following clues, signs and past memories in order to find each other again because somehow they know that their love is true, and they are meant to be together. Oh, the “pull out of the wedding at the last minute” movie. Makes you wonder why anyone bothers to get married. 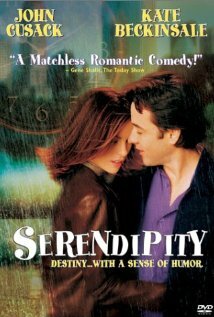 Boring, too mushy, not enough comedy, not my cup of tea, Kate Beckinsale annoyed me, and John Cusack disappointed me. Posted on 24/08/2010, in the whole rom com list and tagged John Cusack, Kate Beckinsale. Bookmark the permalink. Comments Off on Serendipity.